Serbian art produced in the period from 1991 up to present days bears a ballast of years full of crisis, destruction, intolerance and wars. Necessity for new kind of approach and perception, interpretation and presentation of all things that are behind us imposes upon us like imperative, especially today when our society and state slowly become a part of European integration process. We believe that there were too few attempts to present our culture, artistic scene and our potentials to European public, and that more direct approach is required, which will be free of any rigid institutional boundaries, which big institutions and exhibitions by nature have. 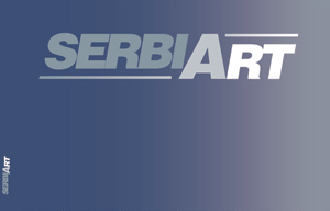 The project was initiated by the painter Milan Bosnić, and is conceived as a series of lectures, projections and presentations of the book SerbiArt (see Publishing), and Serbian contemporary art production in big European cities. Aim is to show a level of democratization of new Serbian art production which has, in spite of isolation and wars, managed to keep up to some extent with progressive European and global tendencies.